#ad – Thank you to Oakhurst for sponsoring today’s delicious post. I am an Oakhurst #SoWorthIt Brand Ambassador. As always, all opinions are my own. My family loves mashed potatoes and it’s something we enjoy frequently at the dinner table. More and more I’m seeing delicious looking cauliflower dishes as an alternative to mashed potatoes. I decided to give it a try! 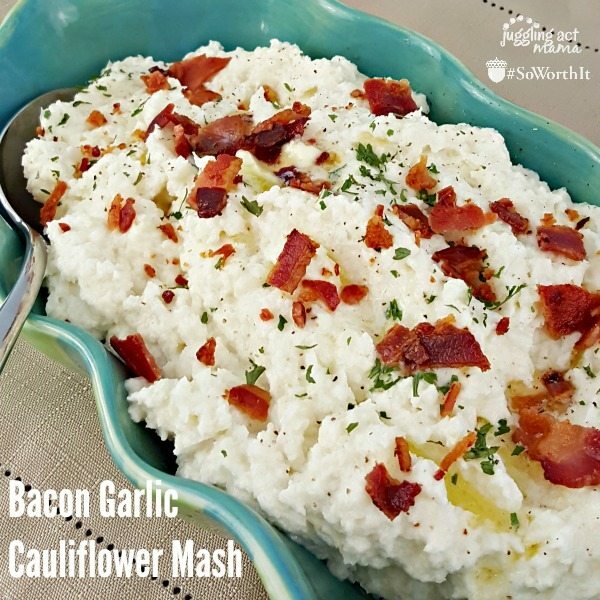 My Bacon and Garlic Cauliflower Mash has all the great flavor of classic mashed potatoes. It’s rich and delicious. You’ll be absolutely amazed when you taste it! Perhaps more importantly, when you set this vegetable side dish down in front of your family, they’ll be grinning from ear to ear. They won’t miss their traditional mashed potatoes one bit. And I have to say, their smiles make the little bit of extra work to cook up this recipe #SoWorthIt. As a mom, every day comes with it’s own set of challenges and joys. Each day is as unique as each of my children. And while you can’t be prepared for everything, I like to think I juggle my tasks to meet my priorities as a mom first and foremost. I like to have a few make ahead dishes in my fridge or freezer whenever I can. Being able to pull out something quickly, even just one component of a meal makes life so much easier to manage. This recipe is one of our top Thanksigiving side dishes! Find more Make Ahead Thanksgiving Side Dishes here. Prepare the dish without the bacon up to 2 days prior and store in the refrigerator. Warm in the oven, then add in bacon just before serving. I love this idea, I bet it would be good with a little cheese on top, too! I LOVE Cauliflower! I can’t wait to try this recipe, I bet I can fake out my boyfriend! I loved this recipe! 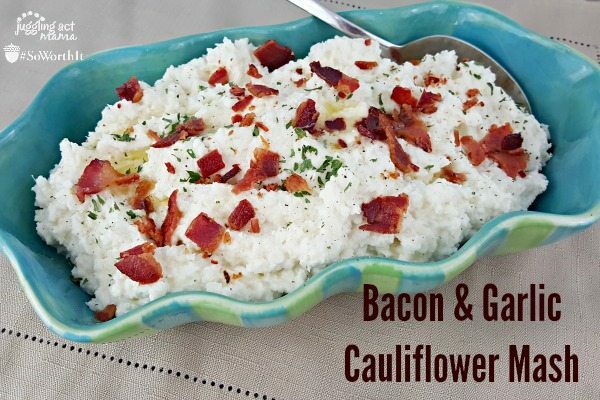 Love cauliflower & bacon separately, so the combination was delish! Tastes just like mashed potatoes, but even better! Thank you so much for leaving a comment, Esther! I’m thrilled you enjoyed these!